I was reading something yesterday that caught my attention. It was about some issue or other, political in nature, it matters not. A commenter remarked that the problem with “getting the minority vote” (in this case the African-American) was that the “Democrat (sic) Party teaches all that stuff about mass entitlement and it’s hard to get those ‘ethnics’ to understand things like responsibility, individual hard work and the importance of our freedoms”. Now we can move beyond the obvious racial tones exuded here, for that is not my point. The speaker here obviously heralds the Republican mantra that above all else are good Protestant values of individual efforts and personal responsibility. 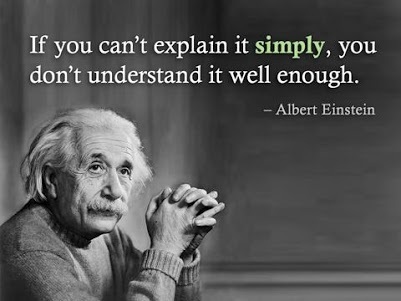 And there is merit in some sense to the argument. These are fine things. We all need them to some degree. They promote self-esteem and accomplishment. Yet, we learn that the is certainly not the basis of our true place in the universe. We are the product, as it were, of cooperation and community. So many things must come together in symbiotic relationship to make us–the laws of physics require that all work together in order to achieve a stable universe, and ultimately humans. Is it any surprise to us that this is true? 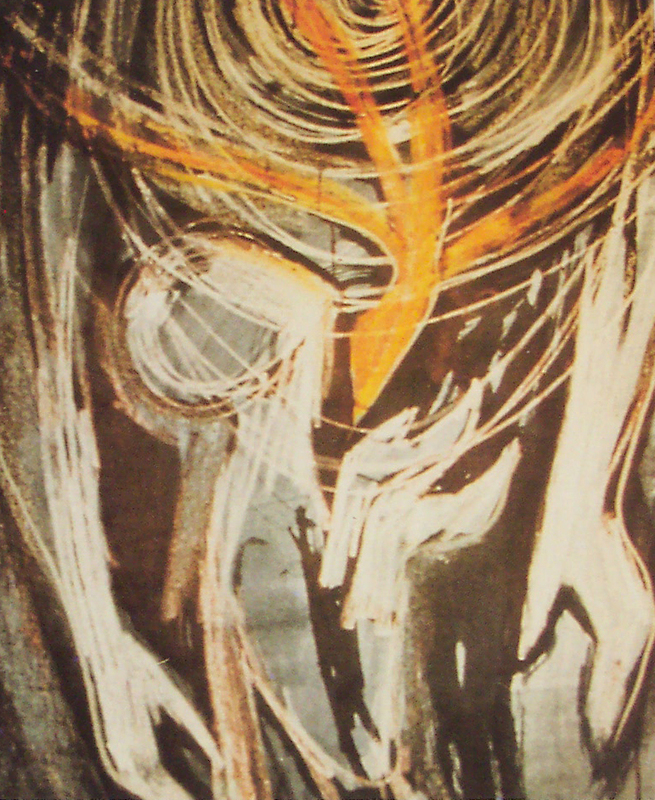 We know that our God mirrors that relationship in the Holy Trinity. God shows us by His very nature that we are meant to work in unity with others to achieve our truest selves. We are meant to be in community. God delights in wisdom. God delights in our minds which surely is a mirror of His own. Wisdom found “delight in the human race” precisely because She realized the magnificence of God in that the sentient mind is a mind made for God, one she can join with and soar to great heights. See how God delights in Wisdom and see how Wisdom delights in human. Wisdom can be who we are. Wisdom is the human mind that continues to crack the code of disease and bring relief and good life to millions. Wisdom is the human mind that creates new and amazing ways by which we can communicate with each other and bring the human family together no matter our physical distance. Wisdom enters the human mind and partners to eradicate fears and superstitions about physical processes. We stand in awe of our Creator as we should. We tremble to think of our place. Yet, God works in good measure. He gives us all we need to join with Him. God graces us with wisdom, with a well-ordered mind, and with the beautiful model of Trinity. When we take these gifts and marry them together in their own trinity, we soar as humans, and we touch the face of God. ‘Do you want to know what goes on in the heart of the Trinity? The Father laughs, and gives birth to the Son. “The Lord says this: A curse on the man who puts his trust in man, who relies on things of the flesh, whose heart turns from the Lord. 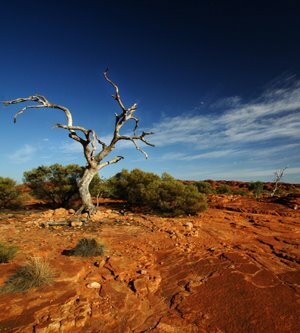 He is like dry scrub in the wastelands: if good comes, he has no eyes for it, he settles in the parched places of the wilderness, a salt land, uninhabited. We are so prone to relying on things of the flesh, our minds, our bodies to make our way in the world. We trust in ourselves and each other to achieve happiness in this life. You are what you make of yourself, we are told. Some would argue that the rich are so because they deserve it, and at least some of the poor because they too have failed to try. Thus, our lot in life is in our own hands. God tells us differently. He tells us that when we rely on ourselves, when we become the “master of our fate” we see through dirty glasses, or as Paul suggested, through a glass darkly. We are simply unable to define what is good and joyous. We mistake happiness for houses and cars, bling in other words. And because of that, we take up our residence in the “parched places, the uninhabited salt lands. We miss the paradise God offers, we simply do not see it. We blindly stumble along in life unaware of the true happiness, the true joy which God extends to us. Quite simply, we life partial lives, unaware, as little more than dumb animals, conditioned to respond to blaring music and neon lights. We become addicted to the glitz, to the ever offered “fix” of adrenalin rush that we think is living. When disaster strikes, as it must in every life, we fall apart. We are without foundation. We flounder, wail and collapse in disarray. The one who knows where in her treasure lies, she is undisturbed. Her joy and happiness is firmly rooted in the reality of God, unswayed by the vagaries of human existence. Her joy is undisturbed. The choice remains for each of us. **The excerpt is taken from the RSV. I checked with the NRSV, and the NJB. Subtle differences in translation miss this insight given in the RSV, or at least my interpretation. It just goes to show you that there is no perfect translation. We are, as believers, quite familiar with Zacchaeus and his story. We are most familiar with the meaning of the story. We know that Zacchaeus was well-known in his town. He was probably not liked, for he was a senior tax collector, meaning presumably that he been a tax man for a long time, and more importantly, that he had done exceedingly well at his job. There is nothing to suggest that he had any intention to meet Jesus, rather, he seemed to want to take a “measure of the man,” this man who people were talking about in the surrounding countryside. There is nothing to suggest that Zacchaeus had any desire to be “saved” or that he saw himself as a sinner. He was merely sizing up the man whom he had heard of, perhaps wanting to see if there was anything about him that suggested he was any of the things people were whispering about. 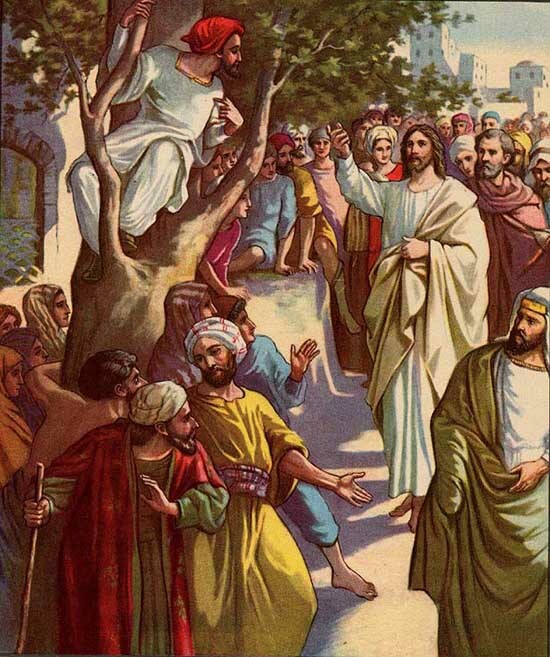 Jesus arrives at the tree that Zacchaeus has climbed and looks up. He orders him down. And he tells Zacchaeus that he intends to supper with him. This must have shocked Zacchaeus, since he full knew the opinion of the Pharisees about him. And it was true, they complained, loudly passing the word that Jesus was intent on eating with a sinner! But eye to eye with Jesus, something happened. This man, who must have been hard-hearted in order to do his job, had a transformation. He immediately told Jesus he would give half of his wealth to the poor, and return four times over any money he had acquired by unfairness. What a transformation indeed. I recall, as I proceeded through the catechumenate, learning about all the Catholic dogma about social issues, sexual to be exact. Certainly most of these were touched on quite lightly, they were trying to convince us to join the Church not run from it. I was troubled indeed about birth control, celibacy issues, homosexuality, abortion, and divorce. These rules basically went against my natural inclination. None of them touched me personally at that time, and perhaps I could have simply ignored them. Instead, I tried mightily to understand why my Church taught these things. I struggled with them in my heart. I prayed about them. In the end, I conformed for one singular reason: my conversion had arisen from the sudden conclusion that I was not wise enough to overcome the depth and breath of intellect that, before me, believed. Here now too, I came to the same conclusion. I must assume the Church to be wiser than me–at least until I had spent time looking deeply into these issues. I trusted in the general logic of Catholicism, the fact that there were no places of which I was aware where there were logical dead ends, or places of deep conflict. All inexorably fit together, and so I accepted what I was taught, albeit with a heavy heart. Over time, I was to learn a good deal more, read a good deal more, have the benefit of learned teachers who had studied these matters thoroughly and come up with different ideas. Slowly, I came back to where I had been, and came to believe that the Church’s dogma was flawed, and understandable from its own history. My point is simply, that I think excluding people as “sinners” for violating innumerable sexual prohibitions should lead anyone to feel exceedingly sad. We are, after all, desirous of having everyone partake of the Eucharist I presume. We want all to be saved do we not? To conclude that some folks must be denied is painful. It was to me at that time, and I would think it would be to all faithful orthodox Catholics. Some of them are quite ugly in their rhetoric. They clearly take great pride in “doing what is hard,” though I’m not sure what is hard about chastising others for not living up to their interpretation of things. Perhaps, we might leave all this other stuff up to God to decide. After all, it’s His kingdom. I have been giving much thought in the last few weeks to the question: Who can know the mind of God? It is an important one to be sure for everyone at all times, but more so for me at this time of transition in my life. How can I know God’s intentions, his plans, more, his desires for me? If I wish to follow, then this is critically important. My life, to this point would suggest that I have discerned the Spirit poorly, flitting from Catholicism, the religious community, away, and then to the Episcopal Church and now turning back homeward. But I wonder, does it really? Today’s first reading poses the question more starkly perhaps than anywhere in the Hebrew Testament. What human being indeed can know the intentions of God? And who can comprehend the will of the Lord? and this tent of clay weighs down the mind with its many cares. who, then, can discover what is in the heavens? and sent your holy Spirit from above? These words of Solomon echo in my heart as well. How, how Lord can I understand what I am to do? I am cautioned not to rely on reason. Paul and many prophets have said as much. We are to be fools for Christ, meaning that the way of the cross is in direct contradiction to right reason. Through utter humiliation, salvation and the right path lies. We are to turn the other cheek, repay evil with good, all unreasonable, yet true. Does this mean that our minds are worthless? I think not. I think those who wish to contain God in a book would like to think so. The fundamentalist makes fun of learning and education, pointing to all the passages that warn of intellectual knowing. They are desperate to understand God by simple reading of the text. Yet, I think they are wrong. God would not give us fine minds if they were not meant to be used. We are to use all our powers of discernment in finding our way in the world. We are to work with our minds to create a world in which all are free, fed, clothed, housed, attended to, as needed. But when we seek to understand who we are and who God is, we must suspend our rational mind, because God is simply bigger than we can grasp. He is the contradiction and the paradox. We approach him with metaphor as the writers of various Biblical books did. I can conclude, and sometimes I do, that I am poorly translating the Spirit’s lead. I am misunderstanding somehow. But perhaps I am merely going through my learning, correcting my errors. I am not suggesting that the Spirit directly sets us up for pain and suffering as a means to teach us lessons. No, I do not believe in a meddling God such as that. What I do believe is that when we get some notions that are wrong, if they will become teaching moments, the Spirit remains quiet, and lets us lead ourselves into the abyss. Always ready and willing to lead us out again, to be sure, but we learn by our own willful choice. And what have I learned? Perhaps humility. I came to Catholicism with a serious believe that it was the best and the first Church. I never let go of that. Even in ecumenical settings where I professed a belief that God reaches to people in all manner of ways, I still clung arrogantly but quietly to the smug belief that I was the better Christian by faith. Worshiping as a Protestant and seeing things from the other side, has done much to help me to break from that ugly belief. For indeed, I do not claim any Christian faith, and certainly no non-Christian faith better than another. Only better for me, me alone, with my peculiarities and personal quirks. I am drawn back to Catholicism because, somehow it resonates more deeply in me than any other. Not because it is the best or first. For indeed I don’t believe I could prove that if I wished to. For those who can’t figure out why I am leaving a perfectly wonderful tradition in the Anglican Church, I can only say, that it has nothing to do with them. It has everything to do with where I am called. Unless of course, this is but another false path in my wandering journey. Then I will, with God’s grace, learn the lesson held out for me. Until then, I do my best, more humble now for sure, knowing that I don’t know, I only believe. Somehow God assures, that is enough.